From-scratch brownies? Yes, please! 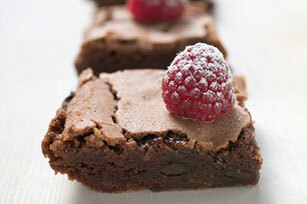 And if you want to jazz up your chocolate brownies with a bit of mint extract and fresh raspberries, so much the better! Microwave chocolate and butter in large microwaveable bowl on HIGH 2 min. or until butter is melted. Stir until chocolate is completely melted and mixture is well blended. Add sugar; mix well. Blend in eggs, jam, mint extract and vanilla. Add combined flour and baking powder; mix well. Pour into prepared pan. Bake 35 to 40 min. or until toothpick inserted in centre comes out with fudgy crumbs. (Do not overbake.) Cool completely. Use foil handles to remove brownie from pan before cutting into bars. Serve topped with raspberries. If baking in a glass baking dish, reduce oven temperature to 325°F. Unlike cakes, brownies are best when moist and fudgy inside. To check for doneness, insert a toothpick into the centre. If it comes out with fudgy crumbs clinging to it, the brownies are done. For a visual test, make sure the edges of the brownies have pulled away from the sides of the pan. Cut brownies into diamond-shaped bars.